Traditionally a panzanella salad is a cold bread salad. I decided to do it as a baked salad to give another option as a main dish for vegetarian guests. This worked out perfectly! One of the most important parts of making this recipe successful (and by successful I mean not having it turn out like mush) is this step. Tear the bread in oversized pieced (I tore each piece in half and then each half in thirds) and let it air dry by placing a cooling rack on a baking pan. 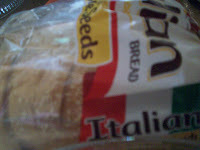 I let mine sit for 24 hours to insure it was completely dried out and stale. If you skip this step it will indeed turn out very mushy. 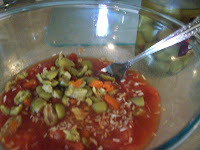 In a large mixing bowl add the can of tomatoes. You made need to use a knife to chop them into small bite sized pieces if they are whole or in rings. Add the olives, onions and vinaigrette. Stir to incorporate. 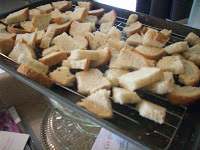 Now fold in the bread cubes so that they’re all coated well. 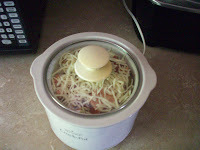 Now spray your crock pot (I used a 1 1/2 quart crock pot) liberally with a non-stick cooking spray. Alternately layer the bread mixture and cheese until you use it all, ending with cheese on top. 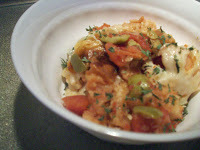 This is a great no meat dish to serve as a main dish, but would also work as a side dish. Even my “no olive eating” husband gobbled it up. Needless to say since it was mostly bread the 3 year old tore it up too.